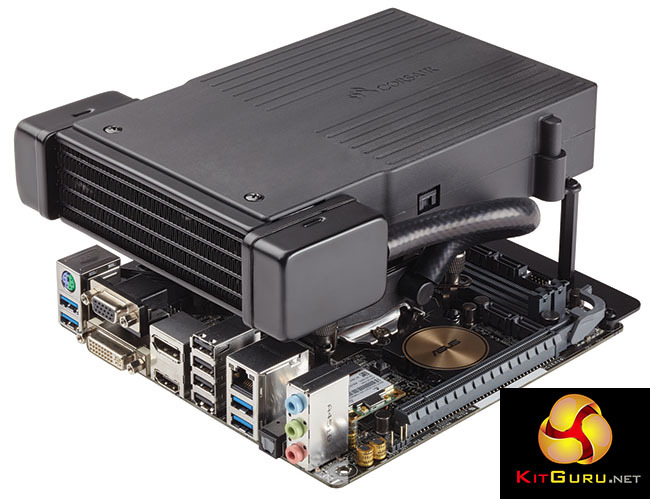 Corsair H5 SF is an All-In-One (AIO) liquid cooler that was developed for the small form factor Bulldog chassis and has now been released as a separate component aimed at the home PC builder. 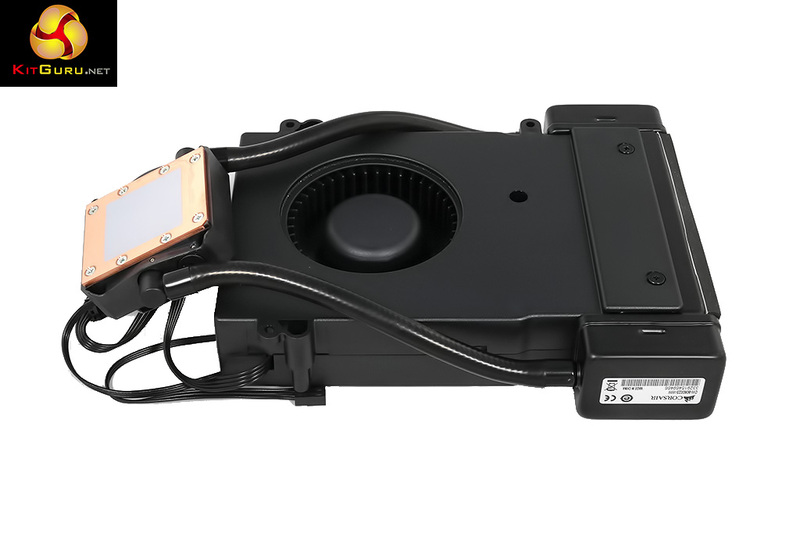 In a conventional AIO such as Corsair Hydro H100i the cold plate/pump unit is secured to the CPU, the fans are attached to the radiator which is mounted on the case and the hoses move the coolant around to keep the whole thing cool. 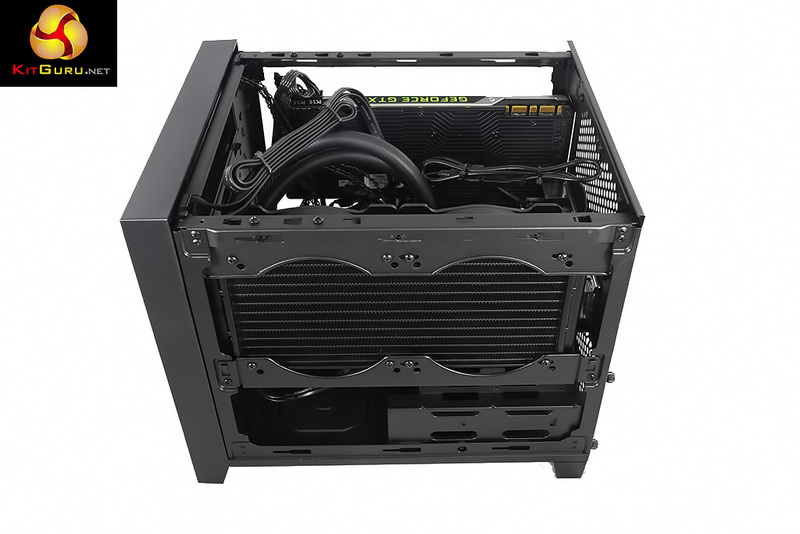 Corsair H5 SF takes a different approach as the hoses are very short and the radiator unit mounts directly above the CPU and is not attached to the case. 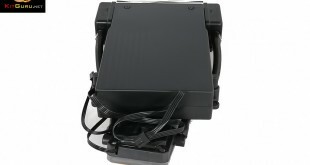 The dust buster-style fan draws air up from the CPU area and then blows it to the rear of the case, where you had better hope you have suitable ventilation that will allow the air to escape. 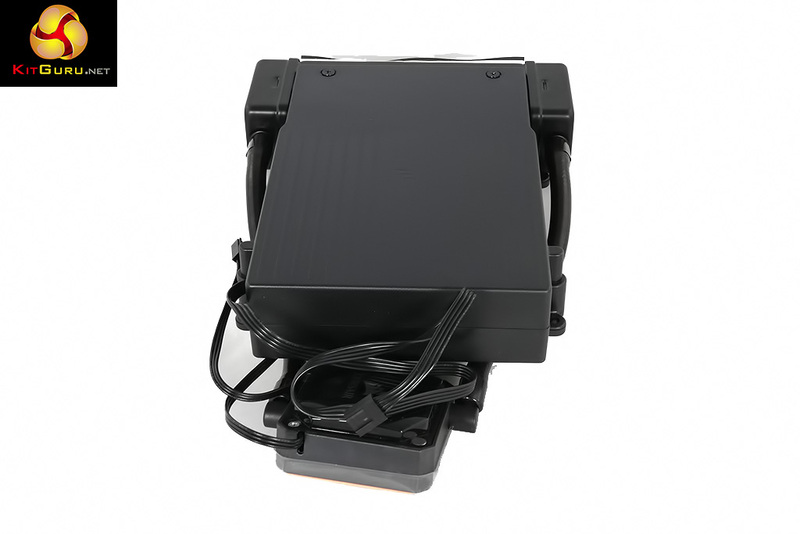 This novel layout has the advantage of being compact and moving air around the CPU socket area of your motherboard. On the downside installation is relatively fiddly. Included fans: 1x 140mm front intake, 1x 120mm side exhaust. Fan mounts: 1x 200mm front, 1x 120mm side, 2x 80mm rear. Internal drive bays: 2x 3.5/2.5″, 2x 2.5″. Dimensions: 351mm x 277mm x 290mm. 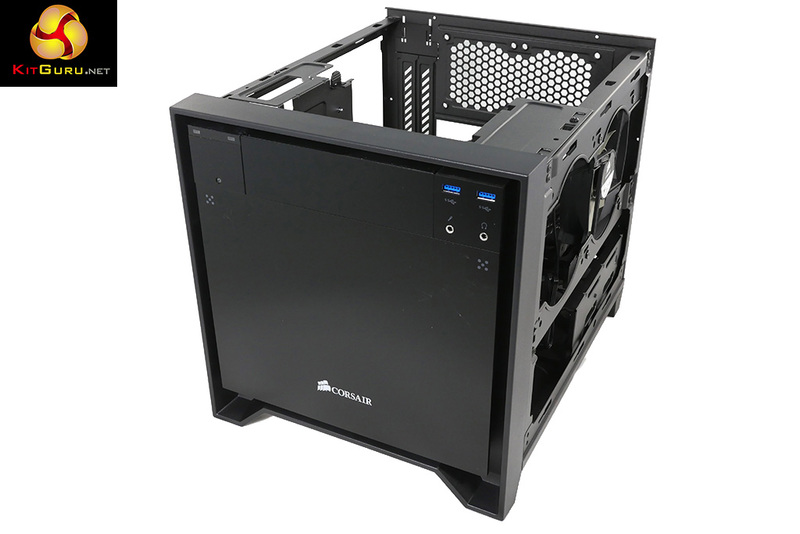 Corsair supplied us with an Obsidian 250D to test the H5 SF which, as you will see in our video, is one of those relatively large Mini-ITX cases that can accommodate full sized components. 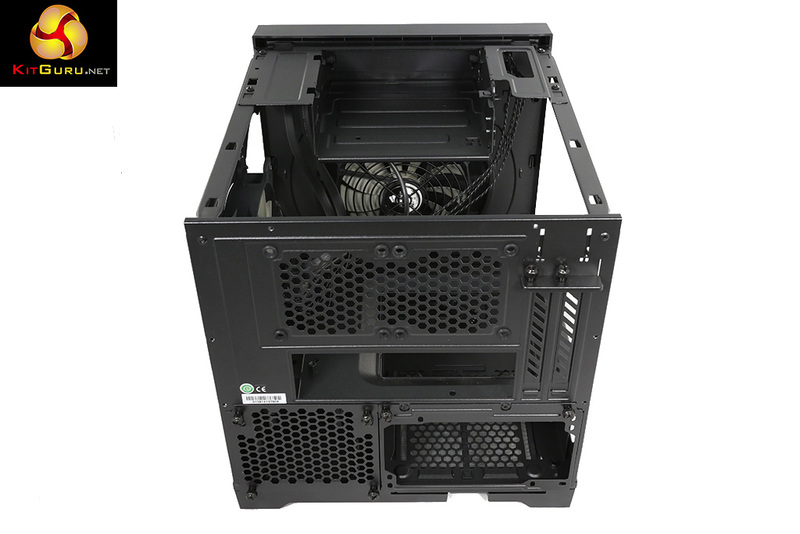 This case is compatible with Corsair H55, H60 and H100i coolers however the maximum CPU cooler height is 95mm so installing an air cooler with a conventional 120mm fan is impossible. Naturally we plumped for a 240mm H100i to cool our Core i7-6700K and as you will see in our video this required us to remove the optical drive bay, the front intake fan and the exhaust fan at the side. Installing the H100i isn’t difficult, although it was very tight for space beside the motherboard where the package of radiator and fans filled every spare millimetre. By contrast the Corsair H5 SF gave us much more working room and opened up a good deal of space inside the Obsidian 250D however it was a fiddly process. 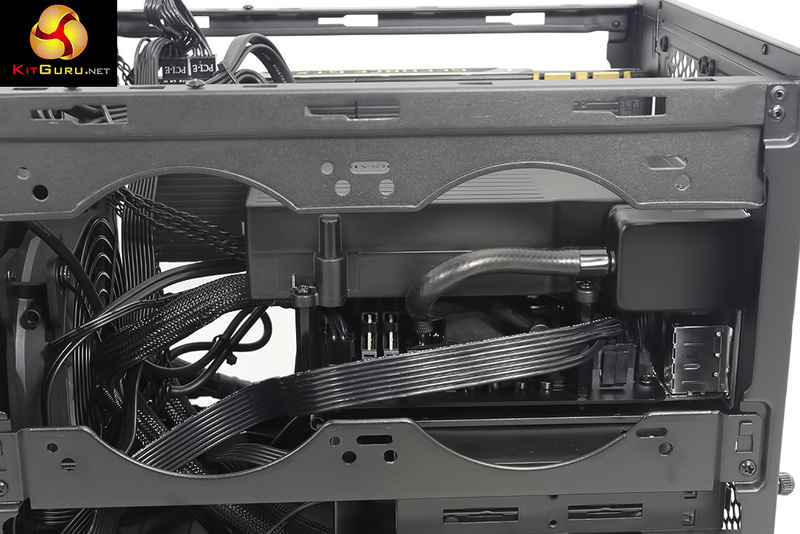 The pump unit attaches to the CPU using exactly the same mechanism as every other Corsair Hydro system and as you will see in the photos and video the radiator/fan unit is supported above the pump on three stand-offs that, in turn, screw into an L shaped bracket. Because one component goes above another you have to be clear about the order of events as access and visibility are somewhat limited. 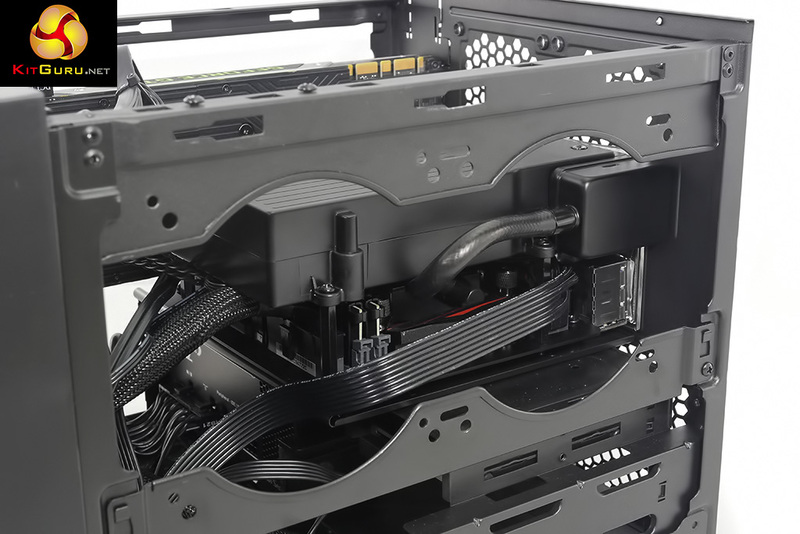 It is also worth noting that the H5 SF requires two motherboard fan connectors (one for the fan and one for pump) as did the Obsidian 250D case with its two fans. 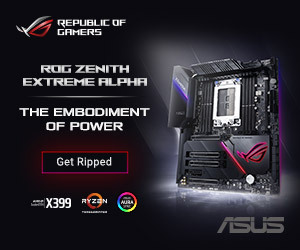 That’s a total of four connections and our well appointed Asus Z170I Pro Gaming only sports three headers. You have to be careful that you don’t get any cables tucked up inside the fan and it also proved possible to kink one of the coolant hoses which didn’t help matters. After half an hour of back and forth the Corsair H5 SF was installed and looked rather smart. To put the cooler through its paces we will be using a test system consisting of an Intel Core i7-6700K, GeForce GTX 980 and an SSD. 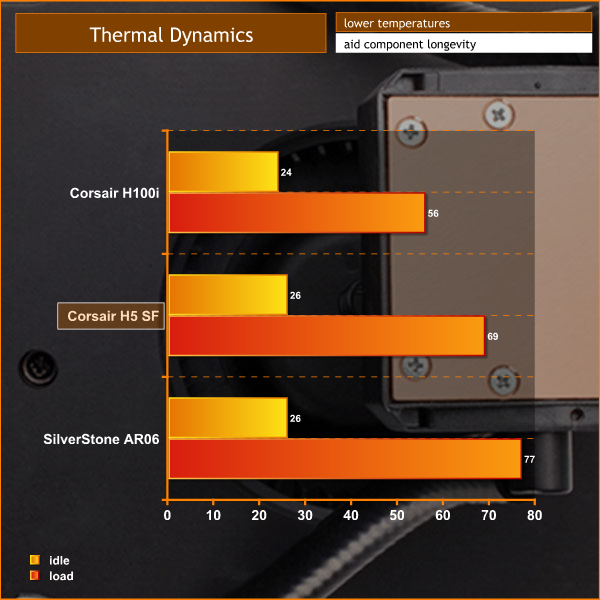 This system allows us to produce a substantial amount of heat and effectively test the Corsair H5 SF‘s cooling capabilities. 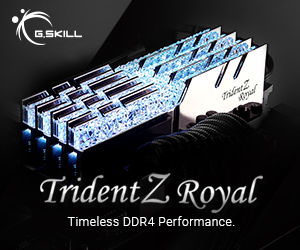 For stress testing we use AIDA64 to create the maximum heat output to stress the CPU and GPU. We set a baseline figure with the Corsair H100i cooler and saw a temperature of 56 degrees which is slightly higher than we like to see for a Skylake Core i7-6700K, even when it is pushed to 100 percent load with a synthetic test. 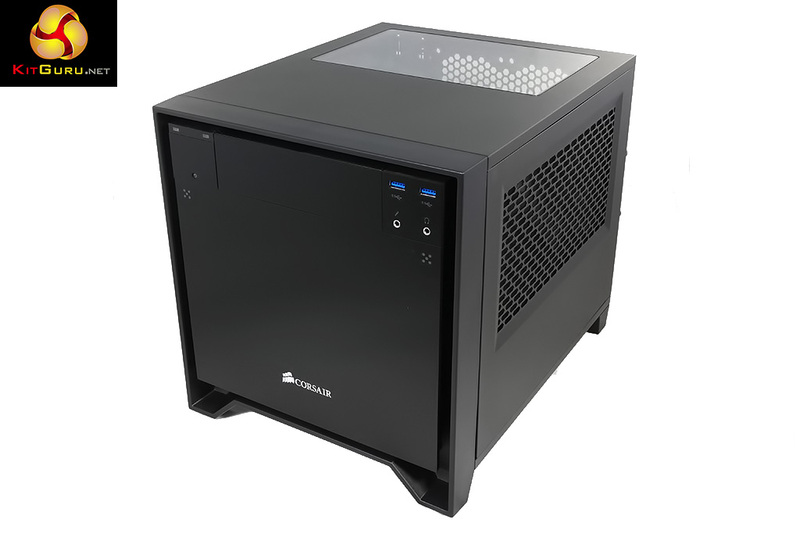 This suggests the Corsair Obsidian 250D has slightly restricted airflow, which is exactly what you expect from a small form factor case. 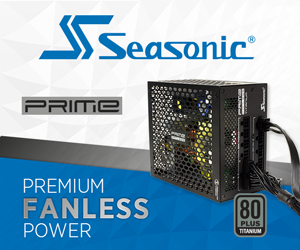 Switching to the Corsair H5 SF cooler gave us a CPU temperature of 69 degrees which is 13 degrees higher than H100i and which seems about right, considering the much smaller size of the cooling hardware. To get a fuller picture we also used a low profile SilverStone AR06 air cooler which gave a CPU temperature of 77 degrees so all things considered the compact H5 SF is doing a perfectly decent job. 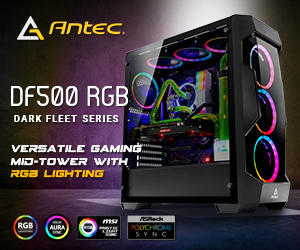 Corsair H5 SF is lovely and quiet when it is operating at low load but as soon as the fan spins up it gets noisy and is noticeably louder than the larger H100i AIO. This is a direct consequence of the single small fan spinning at a higher speed. The Corsair H5 SF is an unusual liquid cooler as it is small and compact with a mounting system that is specific to the Mini-ITX form factor. We weren’t particularly surprised the installation process was fiddly as that is often the way with small pieces of hardware. 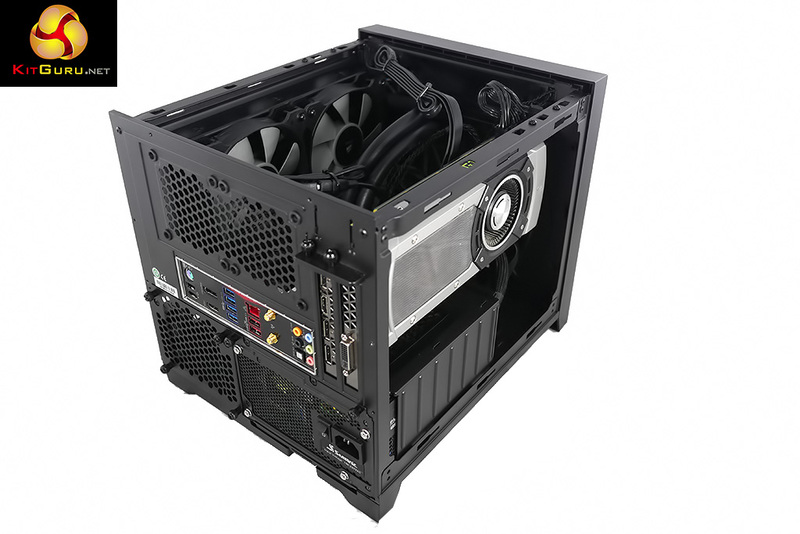 The end result is a cooler that is slightly more effective than a low profile air cooler that costs about £25, however it takes up considerably less space than a conventional AIO and does not require a fan mount on the case. 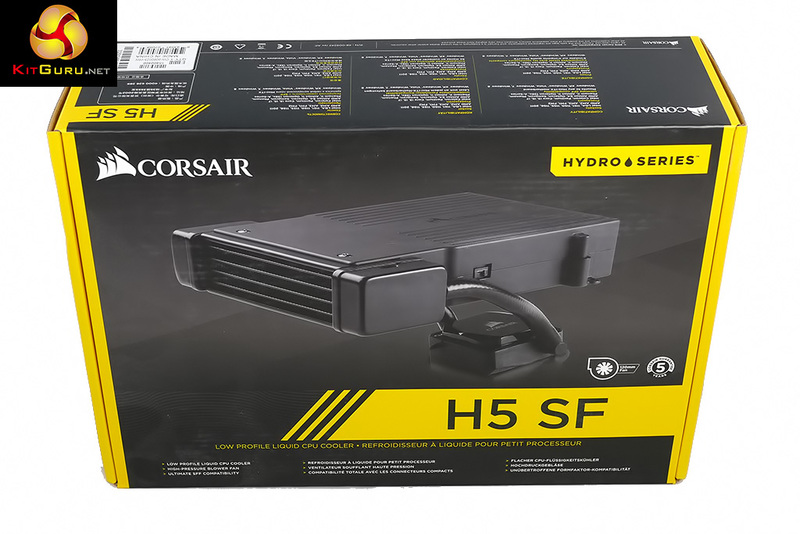 This is probably the most important feature of Corsair H5 SF as the cooler mounts on the motherboard, just like an air cooler, and the case merely acts as a cover and plays no part in supporting the cooling hardware. 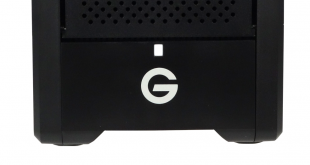 With a case such as Obsidian 250D this doesn’t offer any obvious advantage but some small form factor cases, particularly HTPC style, don’t give you anywhere to mount a 120mm fan unless you fix it to the top panel of the case. This can be awkward when you open the case as the panel is tethered by the coolant hoses. If your case doesn’t give you the option of mounting a 120mm AIO and you feel the need to step up from an air cooler, Corsair H5 SF gives you a new option to consider that may just save your bacon. 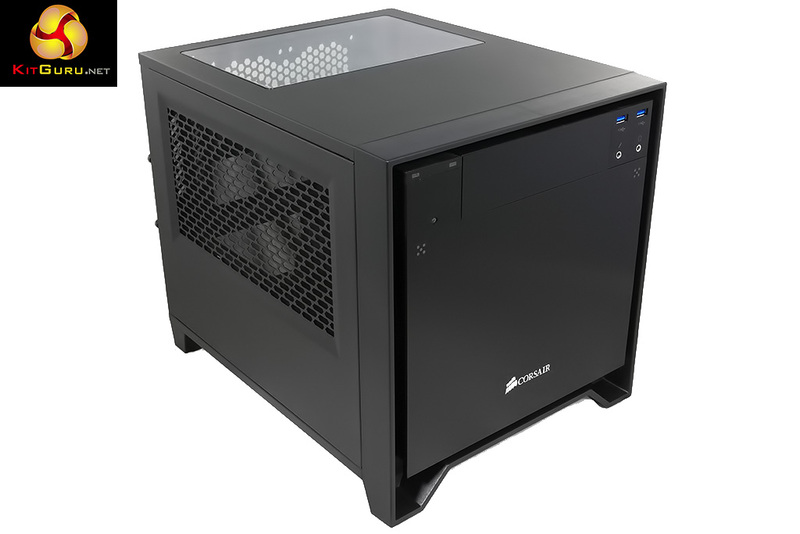 Buy Corsair H5 SF cooler from Overclockers UK for £61.99 inc vat HERE. 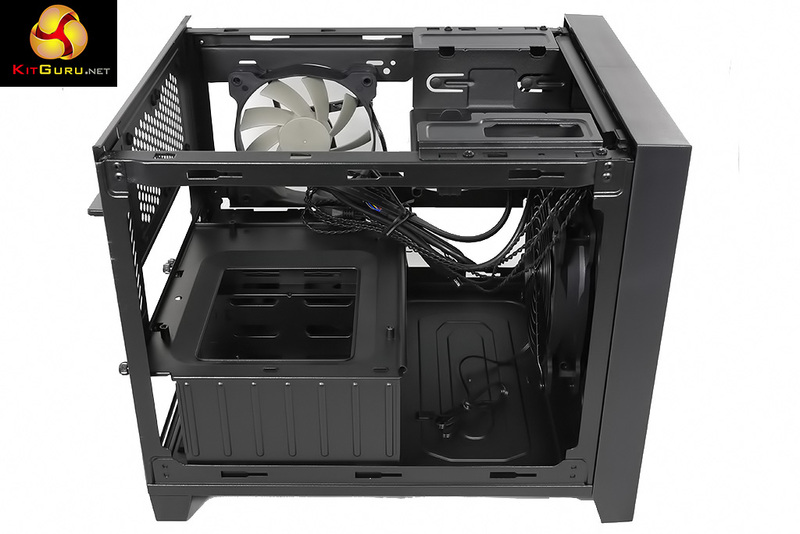 Buy the Corsair Obsidian 250D Case from Overclockers UK for £79.99 inc vat HERE. Mounts to the motherboard, rather than the case. Does a decent job cooling Core i7-6700K. Under load the H5 SF is rather noisy. Installation is a fiddly process. 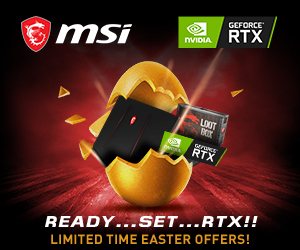 Mounts are only compatible with Mini-ITX. It is possible to kink a coolant hose during installation. 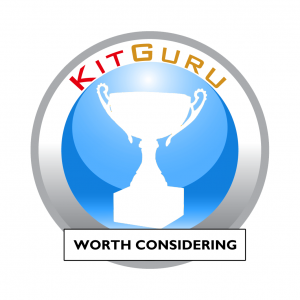 KitGuru says: Corsair H5 SF is a useful option when you are building a PC inside a case with restricted height for your components.